Deaf Parenting UK received Breakthrough Independent Living Awards 2010: Peer Support ’Highly Commended’ Award. The 2010 Independent Living Awards Ceremony was held at Manchester Town Hall, Albert Square, Manchester on Wednesday 16th June. The theme of the evening is ‘Promoting the rights, responsibilities and respect of disabled people. Those Awards were made to bodies or organisations which evidenced innovation and commitment beyond what is currently accepted as good practice. 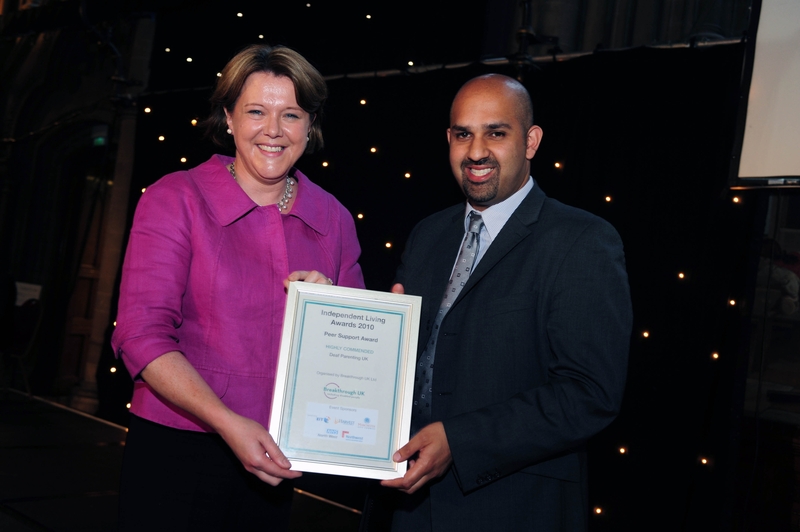 Deaf Parenting UK was delighted to receive ‘Highly Commended’ for Peer Support award presented by Maria Miller MP, Minister for Disabled People and Deaf Parenting UK Ambassador.